Everyone is welcome to attend a book launching and discussion on Wednesday December 3rd at the Just Use Cafe on Spring Garden Road in Halifax. 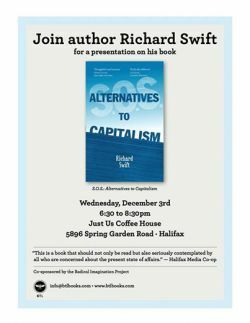 Richard Swift is the author of the book "Alternatives to Capitalism" and this should make for an informative and lively discussion. The event is 6:30 - 8:30 (PM of course). See you there! !